The Federal Government has just warned the public through the ministry of Health against Lassa Fever and the possible causes of this virus diseases. Can Bush Rats or Meat Causes Lassa Fever? The picture below displays a man holding a giant rat which carries this Lassa Fever Virus and people should desist from it either knowingly by eating or unknowingly through dirty environments. To many people, these animals are bush meat and best source of food like pepper soup or some nice vegetable soup for lunch or supper but the Government in Nigeria recently conducted a research about the possible cause of Lassa Fever and rat has been spotted to have cause it. The rat has been said to carry the Virus which cause this disease of Lassa Fever. 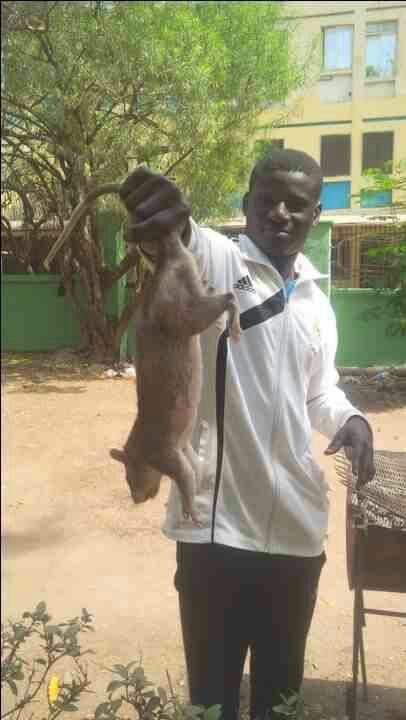 The picture below shows rat being killed by a man which represents a Campaign against Lassa fever caused by rat. To prevent Lassa fever through rat, the Government has warned that people should stop eating rat either big or small and not only that, they should stop killing and eating bush meat because it will also prevent not only from Lassa Fever but from Ebola Virus diseases which is the most deadliest diseases at this time. The photos you have seen on this post shows that if you see such as this, you shouldn't eat it and it will prevent you from contacting Lassa Fever and you will be healthy. In order to prevent yourself from this rat, you also need to keep your environment, ensure you weed it regularly so that many of these rat won't find hiding place in your house, in your kitchen or in the store. This is necessary because when this animals find their way into your kitchen, they may put their mouth into the food stuff and drop some remains into the food like rice and you end up eating this which is bad and not healthy for you. You too can stop Lassa fever by making sure you environment is clean and rat get killed. Tell people around you and let them know the possible cause of this diseases and also show them the rate displayed on this pics and what the Government has said about it. For those who have ears, let them hear and make amends because this diseases is very deadly and cause instant death within few hours of contacting the disease unlike other diseases that still spend few more days, months or years. Thanks for reading.